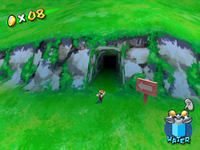 The Hillside Cave Secret is the third episode of Bianco Hills in Super Mario Sunshine. The episode's objective is to collect the Shine Sprite at the end of the secret area. In order to get to the cave, the player needs to enter the lake area once again. Before going through the large gate, the player can find a Pianta covered in Graffiti. After cleaning him off with F.L.U.D.D., he'll tell Mario that a mysterious person broke through the wall blocking the cave. After passing through the gate, the player has to take the ropes connecting the platforms, which start under the bridge leading to the windmill. To get to the last platform, the player has to use the Hover Nozzle, then simply jump onto the ledges leading to the cave entrance above. Upon entering the cave, Shadow Mario will appear and take F.L.U.D.D. away from Mario, then Mario will be brought to an area filled with moving platforms. The first set of platforms move side-to-side and are needed to reach the higher stationary platform. Next is a series of moving and stationary platforms, with the moving ones each moving in a different way. After traversing these platforms is a long bridge with four large, spinning cubes that slide across the bridge. Taking care not to be pushed off, the player has to cross the bridge to the next group of platforms, which are spinning star-shaped ones. Jumping between these and making it to the end will reward the player with the Shine Sprite. This page was last edited on November 6, 2017, at 02:30.